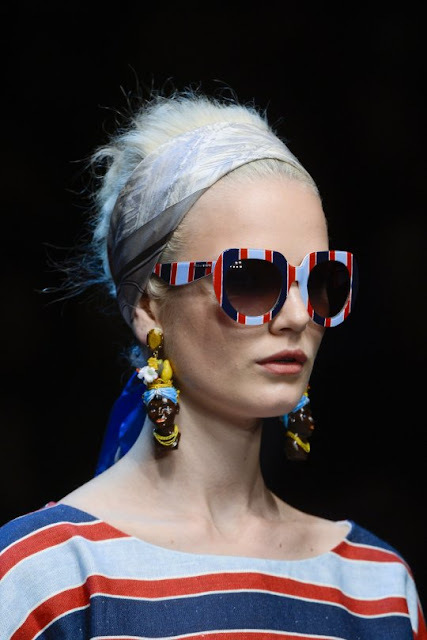 Gender Bender: Are these D&G earrings racist? Are these D&G earrings racist? Dolce & Gabbana recently got a lot of flack for their Spring/Summer 2013 collection when they featured these ‘moorish’ earrings, burlap-sack dresses and fruit cornucopias. Many people criticized them for being racist. They recently sent out an ‘explanation’ on their site, Swine.com, saying: “You might have seen them in some villa or restaurant or hotel in Sicily, dominating the table: colourful head-shaped ceramic vases filled with beautiful flowers. The head is inspired by Moorish features. Moorish is a term used to define many peoples throughout history. Medieval and early modern Europeans applied the name to the Berbers, Arabs, Muslim Iberians and West Africans, although it has to be said that the term ‘Moorish’ has no real ethnological value. In Sicily’s case it defines the conquerors of Sicily.” “Behind the Moor’s head vases there is a legend that is as interesting as its real history: they say that around 1100 AD, when Sicily was ruled by the Moors, a beautiful girl was living in seclusion and spent her days cultivating flowers on her balcony. One day a young Moor passing by saw her, decided he had to have her and entered the house so to declare his love. The young girl, surprised by such a gesture, reciprocated him, but just when she got to know him he had to return to where he came from, to his wife and children, she waited for the night to come and as he fell asleep she cut off his head and used it as a vase for her flowers and put it on her balcony displaying it to everyone. This way his love was forever hers. Since then, flowers grew lush in the vase and the neighbours, envious, built vases shaped like a Moor’s head.” Of course this has a very significant place and part of history, yet I’m worried about the context in which the blackamoor was reincarnated. Should we be seeing this as a celebration of Sicily’s history or are they showing black women in a dated, stereotypical and offensive way? I think that most people won’t be offended by this at first glance, maybe thinking it’s pretty and colourful. Yet, once you start to think a little bit further, you’ll realize that when you take something such as this chapter from the colonial era and make it part of mainstream fashion, then you basically trivialize the impact this time had on the people who lived through one of the darkest times in Western history. What is your take?